For many years now, popular thinking when it comes to eating has focused on having several smaller meals throughout the day to satisfy hunger but not to binge on big meals. I’m always skeptical of nutrition theories and so-called nutrition science because every theory that’s in vogue today is likely to change. 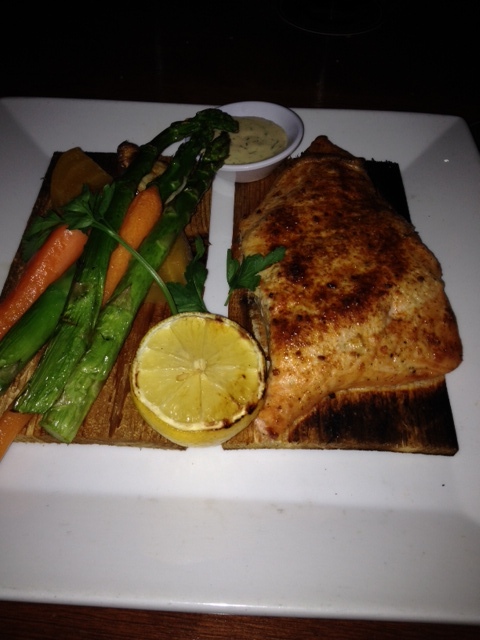 My Seasons 52 salmon with asparagus and carrots, a great low-sodium dish. How man meals a day do you eat? “Eating two large meals early and skipping dinner may lead to more weight loss than eating six smaller meals throughout the day, the study suggests. “Both experimental and human studies strongly support the positive effects of intermittent fasting,” lead study author Dr. Hana Kahleova told CNN in an e-mail,” the item reports. The piece discusses a study of diabetics done in the Czech Republic. The two meals were eaten earlier in the day and dinner was skipped. This goes along with my thoughts on having a larger meal at lunch and a light dinner, a practice I can’t follow these days because of my job but one I did follow when I worked at home and had more control over my meals. Some for you to chew on.